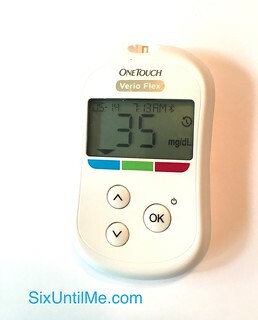 Diabetes Blog Week prompt for Monday: Diabetes can sometimes seem to play by a rulebook that makes no sense, tossing out unexpected challenges at random. What are your best tips for being prepared when the unexpected happens? Or, take this topic another way and tell us about some good things diabetes has brought into your, or your loved one’s, life that you never could have expected? Unexpectedly, my iPhone decided to update itself on Saturday night. I must have “agreed” to terms of service and scheduled the update, but I didn’t think the process through, because if my phone is updating the operating system, that means the processes on my phone are sort of stalled. Including my Dexcom data transmission. Which means I didn’t have any CGM data streaming overnight. The low blood sugar came out of nowhere, a product of stupid poor planning and over-correcting a high in the wee hours of the morning. Mother’s Day morning broke open with my body outlined in damp sweat, my color ashy, hands shaking, but my mind still sharp, considering my blood sugar was 35 mg/dL. Only once or twice before, in thirty years of diabetes, have I ever felt close to passing out, but the precursor feelings seem to be waves of unconsciousness that lap at the edge of my mind coupled with a calm, reasoned mind, as if I knew I was about to go under and I needed to mentally take the biggest breath I could. I had the sense to call Chris (he was downstairs with the baby) and ask him for juice. I was afraid to sit up, thinking that might be enough to tip me into the abyss. Makes me think I could solve quadratic equations while putting out a car fire while sitting in said car. And the car is moving. Fast. Actually, that’s sort of what we do when severely hypo. Unconsciousness due to a low blood sugar is the unexpected I think about the least, but prepare for the most. I mean, I think about it, but not obsessively. I just prepare all over the place, just-in-casing myself with juice boxes and raisins stashed in my frequently visited spots. I try to always have fast-acting sugars on hand no matter where I am. I share my CGM data while traveling. I keep that glucagon shot on the bedside table. Eventually, my blood sugar came up. Exhausted from treading the hypo-waters for so long, I almost immediately fell back asleep on the damp pillowcase. When I woke up again, I looked over at the glucagon kit, thankful for the fact that it was still sealed and hoping it continues to collect dust. If a BG Falls in the Forest, Does it Make a Sound? Robot Arms. Hypo Perspectives. DBlogWeek 2017: More Than Diabetes. Sorry you had to wake to that kind of Mother’s Day but glad you didn’t need the kit. Thanks for the reminder to have glucose at the ready in all rooms. Oh wow! I don’t have a Dexcom so I never thought about how updating your iPhone could cause such havoc. Glad you are OK and sorry that happened. Glucagon now stays in my purse but M knows where it is. We even practiced with an old glucagon kit – – – minus the stick the humongous needle in my leg part. I am glad you did not have to use the glucagon kit, but quick thinking to have it closer. I hope you enjoyed the rest of mothers day after a horrible morning. Sorry you had to go through this, Kerri- been there! It also sounds like a good argument to use the receiver for the G5 at night, just in case the phone fails, or is pre-occupied with some other task, or runs out of power, or….or…or…. the thing I like about the receiver is it has one Raison d’être…..to signal my BG. The phone is multi-tasking and therefore does not prioritize…like we have to! I am glad you are back with us. My unexpected low is waking up with 6 firemen in my and my wife in the bedroom. I was naked. I asked, did I miss the party or was I the party? It got a good laugh. Not a good beginning for any day, much less Mother’s Day. I’m very glad Chris was home and able to help. As much as we all attempt to prepare for highs, lows and total craziness, I hope you don’t have reason to need that glucagon kit in the near or distant future.